Just enough help on hills for an old man. Going from 11-28 to 11-32 doesn't seem like much, but since I didn't have to change anything else, it was great. Shimano triple in front didn't even need adjustment. Nice smooth shifts. A little more noise in the 32 sprocket, but I'm moving so slow, I don't care. Great if you ride some 12-20% hills. Great alternative to a triple! Getting rid of the bike with a triple up front,which I used one to two time a year when difficult climbs were expected. I have since used this cassette and it takes care of any ride. It is not expensive and shifts as smoothly as the SRAM Red cassette it replaced. Of course this is designed for average rides, not racing situations. I am very pleased with this. It satisfies what I bought it for. This is a great combo that keeps me from cross chaining so far and still have a good clogs slection. This cassette really wear great for me I have now use three of them and I will continues to use them. Works as well as the higher priced cassettes with a small weight penalty.Lower cost makes it the deal. Excellent choice for a wide-range road cassette to pair with a compact crank. I purchased this 11X32 cassette to pair with a compact SRAM Rival crankset. This gives me a full range of hill-climbing options without needing to use a triple crankset. 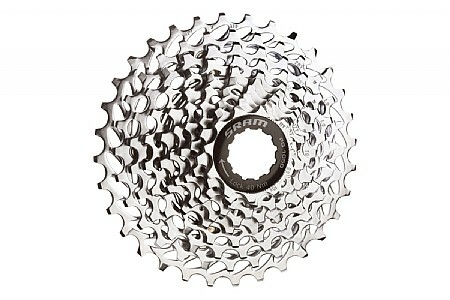 I have come to really like sram products and the 11-32 cassette is no exception. The fit and finish are excellent and the shifting is smoooooooooooooth and crisp what else could you ask for.